reminds us that the natural world is mightier than the transient works of man. Elevation: South 10,358 ft.; Middle 10,047 ft.; North 10,085 ft.
Nicknamed “Faith,” “Hope” and “Charity,” these peaks give Sisters its identity. The South Sister is readily climbed; the other two are much more strenuous. Named for the thick, dark carpet of trees that covers its shoulders, this volcanic cone rises protectively over Sisters. It is the site of a fire lookout and is a popular hiking destination. Visible to the south, this mountain is named for its distinctive, jagged crown. There are several routes to the summit, all requiring basic rock-climbing skills and equipment. This picturesque spire looms between the McKenzie Highway and Highway 20. There is a spectacular view of the peak from the viewpoint above Suttle Lake. The exposed volcanic plug on this mountain has eroded into several pinnacles or “fingers.” This may be the origin of its name, but no one is certain. The second-highest peak in Oregon is easily one of the most foreboding. It is climbable only by highly skilled and experienced climbers. But it sure is pretty from down in Sisters. Whether you came here for an active vacation or just to relax — or for a little taste of both relaxation and recreation — Sisters has plenty to offer. Here’s a list of some of the things you can do while you visit Sisters. 1. Go for a hike: Sisters’ main attraction is its stunning natural beauty and there’s lots to explore if you want to get out in it. 2. Eat an ice cream cone: The tourist experience is not complete until you’ve walked the streets of Sisters enjoying a scrumptious ice cream cone. Gotta do it! 3. Drive McKenzie Hwy. : Take Highway 242 out the west end of town (when open) up and over the Cascades to see some of the most spectacular scenery the Sisters Country has to offer. 4. Ride a bike: You can take that McKenzie Highway trip on two wheels or just tool around town. Visit local bike shops for ideas for rides. 5. Go shopping: In Sisters you will find unique shops and art galleries that make shopping more than just retail therapy. It’s a cultural experience. 6. Get a massage: Visit one of several local spas to unwind from the tensions of your every day life — or to recover from that hike or bike ride. 8. 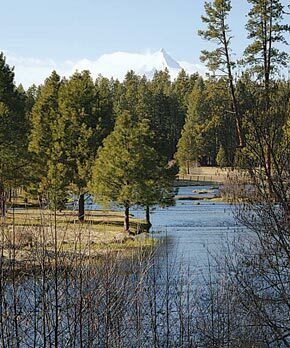 Visit Camp Sherman: You simply must experience the peace and beauty of the Metolius River and the surrounding community, one of the most treasured places in Oregon. 9. Catch some live music: Whether it’s a music festival, a winter concert or a show at one of the local venues, you’ll find some great tunes in town all year round. 10. Dine out: Sisters Country has lots of great choices for breakfast, lunch and dinner — and to suit all tastes and budgets. 11. Take a class or participate in a camp: Sisters Park & Recreation District has a wide range of offerings for some organized fun. 12. Watch a movie: You can catch first-run movies at Sisters Movie House or rent a DVD for family movie night in your room. 13. Catch a fish: Whether you’re a seasoned fisherman or just getting your feet wet, you can find some great fishing in Sisters Country — and plenty of professional guidance to help you get a bite. 14. Visit one of the local lakes and rent a paddle boat, rowboat or a canoe. There’s nothing more relaxing than being on the water. Scenery that’ll take your breath away — time that makes memories. Standing atop the windswept McKenzie Pass, Dee Wright Observatory looks like the lonely lair of a robber baron. The observatory was named after a Civilian Conservation Corps foreman who worked on the site. The observatory offers a sweeping vista of the Cascades and overlooks the somber yet intriguing lava flows that dominate the pass. Interpretive signs offer a little education about the unusual geology of the area. The Pacific Crest Trail crosses the McKenzie Summit just west of the observatory. To get there, take Highway 242 west from Sisters (when passable). 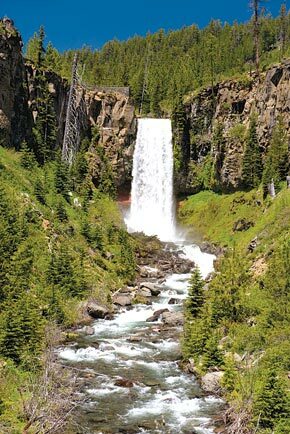 Tumalo Falls is one of the more scenic areas in Central Oregon, and it’s an easy drive west from downtown Bend.Take Highway 20 east to 3rd Avenue south. Turn right on Franklin Avenue and head west from downtown Bend to Galveston Road which turns into Skyliner Drive and leads to the gravel Tumalo Falls Road. There’s an overlook (short walk) and interpretive site and a picnic area. If you want to make a hike of it — and you should — there are many trails in the area. Hike upstream along the creek and you’ll run into more waterfalls. While you are in Camp Sherman, head further north to visit Wizard Falls Fish Hatchery. When you cross the bridge over the Metolius River and enter Wizard Falls, you know this is a special place. The clear, aquamarine color of the river water leads into a pristine grassy area and gentle paths winding through the 35-acre site. Various open tanks house the different fish species raised at the hatchery. Rainbow, brook, cutthroat and trophy trout, kokanee and Atlantic salmon are part of the three million fish on display. The hatchery hosts Kids’ Fishing Day on the second Saturday in June. Wizard Falls is open from 8 a.m. until 7 p.m. Take Highway 20 west out of Sisters for 10 miles. At the Camp Sherman road sign, Road 14, turn right and travel 10 miles to the hatchery entrance. Suttle Lake is one of Sisters’ understated natural wonders. It’s not dramatic or spectacular, but it is one of the most soul-satisfying spots in the area. Some days the lake is calm and glassy, offering a lazy afternoon on Cinder Beach looking out on Mt. Washington. Other days the wind whips the lake into a whitecapped chop and windsurfers weave through the waves. In the fall it is a riot of color as the leaves turn with the early frost. Visit the Lodge, take a boat out for a lazy day of fishing or take a stroll around the lake. Follow Highway 20 west 16 miles from Sisters; turn left and follow the signs. It’s hard to believe that the mighty Metolius River starts from tiny springs in the shadow of Black Butte. Over the next five miles, more springs and tributary creeks build the river into a magnificent rushing torrent. The Head of the Metolius is one of the most serene and beautiful spots in Central Oregon. And it’s very easy to get to. Just drive 10 miles west of Sisters to the entrance to Camp Sherman and follow the signs along Road 14. They’ll point you to an expansive parking area where you can walk down a paved path about 300 yards to an overlook that treats you to a calendar shot of the headwaters and Mt. Jefferson. The Deschutes Land Trust acquired 145 acres of rare wetland/wet meadow habitat just north of Sisters and manages the site as a preserve. Camp Polk Meadow is the site of the first settlement in the Sisters Country. Camp Polk was established as a military encampment for the suppression of local Indians in 1865. The Land Trust is working in the area to restore riparian habitat along Whychus Creek in hopes of one day restoring steelhead runs in the creek. Guided tours are given throughout the spring and summer. For more information call 541-330-0017 or visit www.deschuteslandtrust.org.